Are Your ‘Love Pores’ Clogged? I grew up in a home with the philosophy that ‘a day well spent was a job well done.’ Now that’s good–right? ‘Whatever your hands find to do, do it to the glory of God,’ ‘cleanliness is next to Godliness,’ ‘idle hands are the Devil’s work tools’… To this day I am wanting to measure the success of the day by what I accomplished–visibly. Clean house, painting started or finished, blog posted, errands run, dinner on the table, dog walked. In fact, I LOVE checklists and seeing how many checks I can make in a day. It’s an adult version of a chart full of gold stars. Although important, these are not the measurement of love. 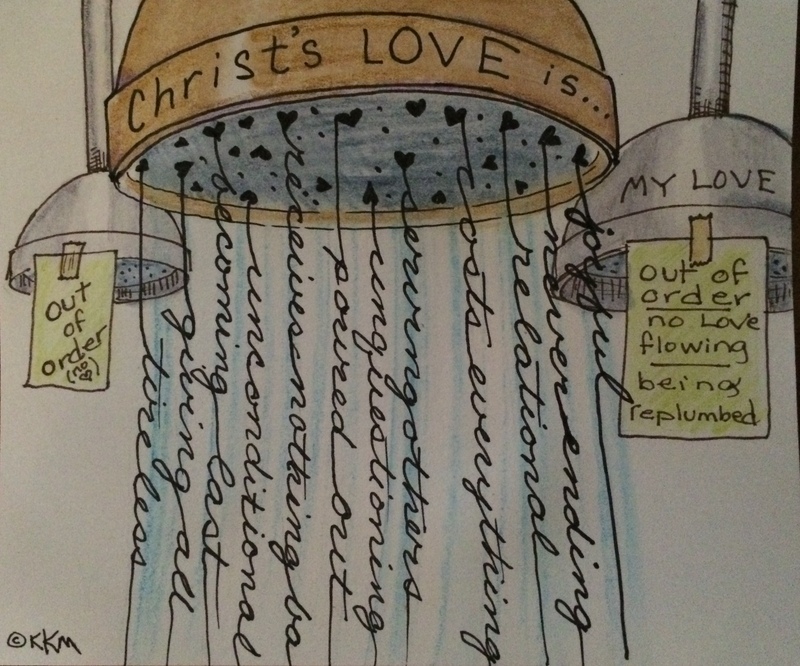 And if love is the ‘measure’ of a Christian than possibly, I’m ‘out of order.’ Possibly my ‘love pores’ are clogged. Slowly but surely God is replumbing me with ideas and visions of what His love is. For me, it is a paradigm shift, a proverbial Roto Rooter of unclogging my heart pipes from my agenda to produce–by the worlds standards–and preparing me to have a fluid, ‘it’s-okay-if-you-inturrupt-my-day, I’m here to serve’ attitude. I am so far from perfect love (Christ’s love), but hopefully, by His grace, His love will start flowing through me, showering everyone around me, cleansing hurt, fear, hunger and need–no matter my agenda at the beginning of the day. Admittedly, this is a tough lesson for me.